How my biggest loss (of thousands) has been the best reward & now you benefit! Have you ever looked at somebody and thought to yourself,’ damn woman, you really do get all the luck!’ I think we all have. But I long let go of that idea for two reasons. Once somebody told me I’m a ‘lucky’ one, because I appeared to always have everything work to my favour – so not true! We all win some and we all lose some but I will say, I have determination on my side which may be misconstrued as something else. Not sure. Secondly, I realised a long time ago that luck wasn’t something you were given, it was something you believed it. Further to that, somewhere, somebody is possibly looking at you thinking the exact same thing, and that you’ve got all the luck! Life isn’t always as it seems. Almost 1 year ago after having a lot of wins and equally as many fails, I had the biggest down and out to date. I lost a LOT of money. Technically, I didn’t lose it. It was stolen. (GASP!!) I’ve hinted to the fact that 2016 was a crappy year and tried not to go on too much about it because I really didn’t want to give it energy – it certainly didn’t deserve it. I did also write about it briefly, but I was determined not to let it rule. Give anything, good or bad attention and it is sure to snowball. Drama can really kill your joy, I’m here to say that much. But now it’s behind us and more than anything we are all in this together. There has to be something good that can come out of my loss, that is how can I learn and how can I help you not to make the same mistake as me? This last year has taught me a lot about life, about business, about family and friendships and above all, that trusting your gut is sometimes your only way of making a sound decision. Truth is, whilst I had money stolen from me, I too had to take responsibility for what had happened. I had seen the warning signs, my gut had told me daily that something was up, yet I was ignoring it, all because I didn’t want to be wrong or upset anybody, I was acting like a coward. Turns out, wrong was an understatement and there I sat, at a loss of hundreds (of thousands) and I was at the head of it all. I can’t necessarily blame others for mishaps that happen in my life – I am actually responsible. Life is what happens to us when we are making other plans – John Lennon. + For me to have lost so much, I had to be doing something right. I had it to lose. Win some, lose some. It’s all a bit of a game really and whilst it can feel so serious, without being rude – nobody died, we all have our health and are happy. That matters most, hands down. + My gut told me so. Even though I was shocked, deep down, I already knew. It has taught me to NEVER, EVER second guess. Ever. I’ve my own little GPS and it’s spot on the money, every. Single. Time. My promise to myself is that I will always consult it from here on in. + Bigger business – bigger problems, are sure to arise, it’s not necessarily about what you do in the moment, but what you do to overcome the moments. After all, this was just a snapshot of a small window in a 13 year business. + I create my own reality. Unfortunately (or perhaps some might say fortunately) no knight on a shiny, white horse was going to sweep me off my feet and make it all happen for me. I had to get up and do that myself. So I did. + In any moment we can grow. And that was it. I sat and poured my heart into that interview because I knew I could help somebody else reach their own goals and take their business to a crazy new level. I could teach others and help them learn from my mistakes. In my heart that made it all worthwhile, I could use a horrible experience and turn it into something truly amazing. And here’s where you benefit. If you’re in business or perhaps you have a glimmer of an idea and you’re just not sure where to next, can I help you? 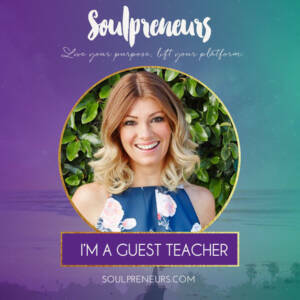 I, alongside a panel of incredible experts make up the teachers and guest teachers of the Soulpreneur course – whether you’re a start up business, a writer, a practitioner, a coach, presenter, artist or you’re just looking for that next thing, you’re going to want to check it out. Enrolments officially open today and are open for ONE WEEK ONLY meaning you need to get yourself sorted stat. School starts Feb 1! Because there isn’t a moment to be wasted, I suggest two things. If that internal GPS of yours is frightfully and wonderfully shaking you saying “um yes lady this has our name on it, what are you waiting for! ?” then click here to learn more. If you need a little more, I’ve got the audio to my interview available for you to listen to right here. You might like to pull out the headphones, take a listen and see what it’s all about. It might just resonate. I’m not stopping there, it’s not a ‘but wait there’s more’ situation but more so a next level to the Soulpreneur course. Can I keep you entertained for a minute longer? As part of me stepping up and making something of last year for MYSELF, I got on a jet plane to the other side of the world, to meet up with my gal Nicole Jardim and together attend a health summit for peeps like us (you know, lady part fixer-upper-ers). Now, you might have heard me talk about Nicole before not just because she’s a really good friend of mine, my co-host to our podcast, The Period Party (we’ve had 200,00 downloads and over 70 episodes!) but because she’s an AMAZING, next level women’s health coach who has helped hundreds of women fix their periods and therefore their LIVES. 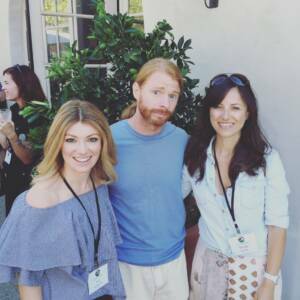 Nicole and I with JP Sears at Mindshare – we laughed a LOT. I know (because my inbox tells me so and I promise I’m listening), that so many of my readers and followers are wonderful coaches, practitioners and educators. You have asked me many times just how you can take your skills to the next level when it comes to women’s health and hormones and could I help you. Truth is yes! You want to know how I’ve done it and I’ve said it many times, I’ve simply continued to educate myself along the way. So, because you’ve asked me to help you THIS is for those of you who are at the next level and specifically keen to grow your skills in this area. Nicole is opening up her virtual doors and inviting you to join her as her apprentice as part of her ‘Fix Your Period, 5 Month Apprenticeship Program.’ You can be anywhere in the world. That means, there’s no excuse. Because I know you’re committed to your ongoing education AND you’re a smart woman (or man), AND 5 months is a fair commitment, Nicole has created a video series to help answer any of your questions before you jump into the apprenticeship program. I can only WISH that something like this was around when I started out as a young practitioner!! To check that out, click here. I believe the series will land in your inbox over the coming week. She’s so hot, I’d watch it just for the eye candy. If I were you, I’d be totally signing up. Nicole’s program launches March 1st, which means if you’re really keen you’ve got loads of time and could even do both! Whatever is resonating with you, be sure to check it out, sit with it, listen to your gut and jump in head first. I’ll be sure to remind you when these programs are coming to a close, but in the meanwhile, check it all out and assess your options. This is one way to make 2017 fabulous!